Try Teak Solutions Patented “Resin Infusion Process” instead of deck replacement. 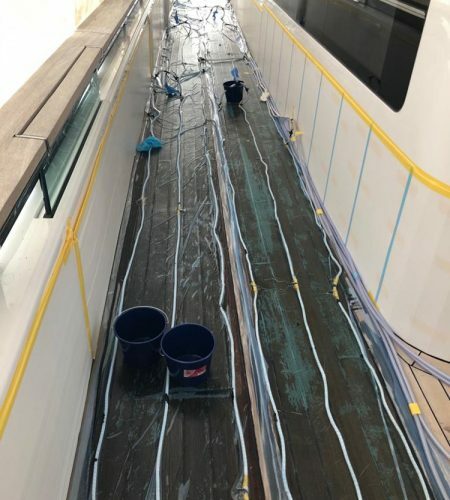 We have all seen the heartbreaking sight of 18mm of perfect teak being removed in splinters from a two-year-old teak deck because faulty adhesive was used in the installation. It is possible that as much as 30 per cent of the teak decks manufactured and installed are removed and or replaced prior to the wood wearing out due to faulty installation or product failure. Teak Solutions was the first company to aggressively research and test methods to ‘save’ essentially new teak decks. This approach seemed prudent given the dwindling quantity and quality of teak coming from the forest. 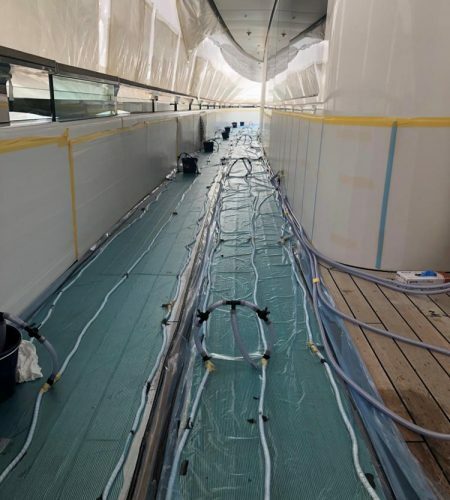 The research revealed that the primary cause of early deck failure necessitating replacement was voids created by improper installation. All teak decks develop some leaks over time. When a few teak seams open or battens crack and cause leaks on a well designed and installed teak deck, there is really nowhere for the water to go and the problems are minimal. On poorly designed or badly installed decks when the seams open, the water runs into voids under the teak. When stepped upon, they expand and the void worsens. Eventually the teak deck lifts and the trapped water which often contains salt causes corrosion which can lead to structural damage. With the problem identified, Teak Solutions has developed a cure, our patented “Resin Infusion Process”. More research, testing, developing of methods, special equipment, and proprietary materials were required. When testing was finished the writing and attaining of Infusion Process” where in a very simple explanation of a complex solution the voids under a teak deck are opened to atmosphere, special two part resin infused into the voids with pressure thus filling the voids and returning the deck to a solid state. decks; reducing the impact on the rain forest; keeping the yacht in service; and in fact, the quality of the teak saved simply could not be replaced for any amount of money on today’s teak market. If you have a teak deck which is beautiful but having problems, maybe Teak Solutions patented “Resin Infusion Process” can save it. Call Teak Solutions, our patented Resin Infusion process is proven, it works and will save your teak.